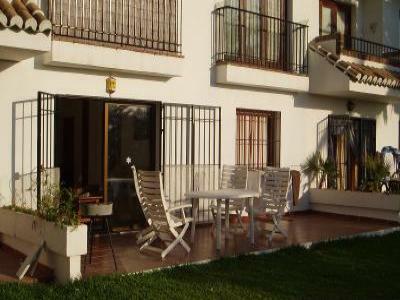 Arecife-Isabel, Riviera Del Sol, Mijas Costa, Malaga. with a shared swimming pool. the other with 2 singles. microwave, fridge-freezer, washing machine, kettle and toaster. There is also an iron and ironing board. exellent value drinks and food. Tennis courts can be hired at the Aztec Club only 10 mins walk away. or a taxi rank near the entrance to the estate. Mijas (5 mins by car).